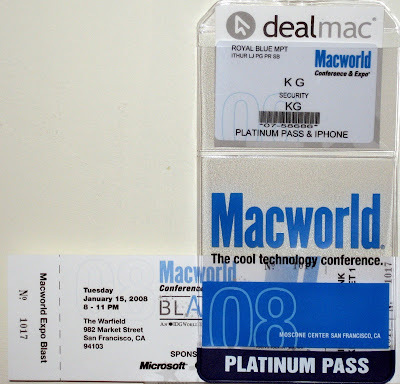 Superimposing Nothing Nowhere: Another Free MacWorld Platinum Pass? Yes in 2008! Ahhh, but it's even better than P/Cs - assuming the encryption algorithm is approaching a uniform cyphertext distribution (which is the goal of most cryptosystems), then the EXPECTED crack time is equal to P/2(Cs). "We have the following possible matches based on your lookup information. If you see a record listed here that matches your information, you can choose it to view a confirmation of your registration. If you are not listed here, and would like to begin a new registration, click the 'Next' button to continue." Also, the priority codes are visible but hashed with md5. Since they are so short, it only takes about 5 hours to crack them all. nice handy work, keep cracking. The picture says "PLATINUM PASS & IPHONE." Would you have been theoretically eligible to get a free iPhone also? My other question regards your timing. From the text, I'm assuming that you posted this AFTER Jobs' keynote, but I wonder if it would have been better to post it AFTER the entire show had concluded? I'd like to hear your thoughts on the timing of the release of the information. Out of curiosity, what software do you use for your cracking cluster? @Ontario: All MacWorld attendees can try for the free iPhone. Just goto the web site and enter your address. The timing was after the keynote for a reason. It could have been earlier because the 'free' code had already been removed from the back-end. @Damon: MPICH2 + John the Ripper. Easy to do with the new Backtrack 3 Beta and PXE booting. So has the issue been fixed for MacWorld 2009?